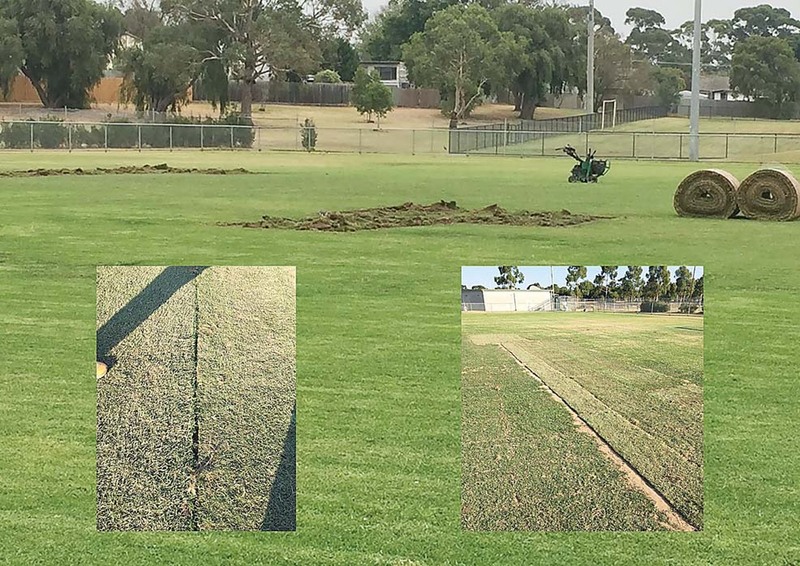 FRANKSTON council re-turfed Monterey Reserve on Friday and the work was so extensive that Southern United was forced to call-off five matches scheduled for the venue on Saturday. The local women’s club plays at the elite level of the sport in Victoria and president Shannon Palmer was furious that no-one from council contacted her to tell her what was planned. “It’s a complete and utter debacle for us,” Palmer said on Sunday. “I don’t know why they didn’t contact us and tell us what they’d planned. Southern was forced to cancel its under-12, under-14, under-16, under-19 and senior matches. “This has had a huge impact on our club,” Palmer added. “We’ve lost all the takings from the day and we now have to play all the matches on consecutive Wednesdays at either Knox (Regional Football Centre) or Darebin. Pines are due to kick off their league campaign on Saturday at Monterey Reserve and president Steve Spencer plans to contact council to make certain they know of the club’s needs. “When I saw what had been done I was shocked because there was about an inch and a half gap between the existing pitch and the new turf and it didn’t look to me as if it had been properly bedded in,” Spencer said. In NPL2 East news Langwarrin lost its second match of the league campaign when it went down 2-0 to St Albans Saints at Lawton Park on Saturday. St Albans took the lead in the 32nd minute when Langwarrin’s defence couldn’t deal with a long throw-in and Michael Grgic’s shot was blocked but the rebound fell to Adam Hodor on the right of the area and he drilled a low drive past keeper Fraser Maclaren. Right on half-time Joseph Monek blew a great chance to make it 2-0 when he shot wide with just Maclaren to beat. St Albans went 2-0 up in the 57th minute when midfielder Dominic Falla won possession just inside the attacking third and waltzed through a paper-thin Langy defence before slamming the ball past Maclaren to seal the issue. Langwarrin’s under-20s recorded a 1-0 victory after a week of upheaval sparked by the resignation of head coach Paul Truman following the previous round’s 6-0 hammering from Springvale White Eagles. Doug Hodgson and previous assistant Ben Caffrey are in charge and the under-20s program will now come under the control of club technical director Stephen Fisher. Truman was appointed last October and his tenure lasted five league matches. In State 1 news Mornington went down 1-0 at home to Malvern City on Saturday night. The local side was without off-season recruits Andy Mclean and Ross Clark who had carryover suspensions while Sam Scott was injured. The match was just two minutes old when Charlie Parker bundled over Arthur Papadopoulos inside the area leaving referee Manny Haractsis little choice but to point to the spot. Papadopoulos took the conversion attempt but his poorly struck effort was easily saved by Mornington keeper Taylor Davidson. Michael Papanicolaou should have put Malvern ahead with a free header in the 10th minute but Davidson saved again. Mornington’s best chance of the half fell to Sam Catherine who got free on the left of the area only to strike a low shot across Malvern keeper Satoshi Osugi and barely wide of the far post. The home side struggled to contain the pace and surging runs of Malvern right back Daniel Bowman but the decisive moment came via Bowman’s vision and distribution. In the 80th minute he sent a precise diagonal pass from the right to Papadopoulos just outside the area on the left and he took one touch to control the ball and with his second dinked it neatly over the advancing Davidson for the match winner. It was a moment of quality that broke the hearts of the home fans. Bowman’s display caught the attention of many onlookers including NPL coaching staff and Malvern will do well to retain him for the remainder of the season. In State 2 news Peninsula Strikers defeated Old Scotch 2-0 at Centenary Park last weekend. Central defender Michael Hoogendyk and midfielder Danny Brooks were suspended while midfielder Bosco Abbasmoi has had to go overseas due to a family tragedy and is not due back until early May. Strikers were active in the transfer market late last week signing midfielder Jonny Guthrie from Langwarrin, striker Antun Velic from Mazenod Victory and midfielder Jullet Martin from Morwell Pegasus. Martin was in the starting line-up while Guthrie and Velic came off the bench in the second half. This was a dour contest that was often difficult to watch but Velic was free at the back post in the 63rd minute and headed back across goal where Adam Crabb slid in and scored from close range. Alpha Turay’s late goal put Old Scotch out of its misery. In State 4 news Baxter lost 5-2 at home to Chelsea while Seaford United went down 4-1 away to Dandenong South. Harry McCartney reports that Dandenong South went 1-0 up after just two minutes when Hakan Yildiz broke clear and sidefooted the ball past Seaford keeper Anthony Madafferi. In the 17th minute Ibraim Ibraimi was at the back post and his shot made it 2-0 and seven minutes later Ibraimi’s free-kick from just inside the attacking half was completely misjudged by Madafferi and sailed into the back of the net to make it 3-0. That was the half-time score but Seaford had plenty of the ball in the first period with new recruit Luke Murray and Matthias and Jeremy Schwellinger all going close while Conor Mcfall hit the woodwork. Two minutes into the second half Yildiz scored again and Seaford’s consolation goal came in the 84th minute via a clinical finish from Murray. Late in the match a melee erupted and Dion Brown was the only player sent off despite a number of flailing fists and feet. Meanwhile Rosebud announced its arrival in State 5 South with a thumping 5-1 win away to Bunyip District last weekend. Bunyip took the lead in the 2nd minute thanks to Andrew Yeo but Chris Parry equalised in the 35th minute. Rumour was rife that a row in the Bunyip dressing room at half-time led to the substitution of striker Daniel DiVito and Rosebud ran away with the contest in the second half with goals from Blake Hicks (2), Parry and substitute Liam Edwards. Somerville Eagles started their title tilt in style with a 2-1 away win over Endeavour Hills Fire on Saturday. The Eagles featured five new signings in the starting line-up – Carlo Cardoso, Daniel Hodge, Callum Richardson, Mark Pagliarulo and captain Charlie Conrath. The visitors came close on several occasions but right on half-time great hold-up play from Hodge then saw Pagliarulo roll his man and smash the ball into the roof of the net from a tight angle to make it 1-0. The Eagles kept their opponent at arm’s length in the second half before extending the lead in the 60th minute when Pagliarulo turned his man inside out before crossing the ball to Richardson who bundled home his first competitive goal for his new club. In the 88th minute Endeavour captain Johnny Negassi curled home a brilliant free-kick but the Eagles comfortably held on for a deserved win. Injured Somerville co-coach Dave Greening was delighted with the opening day win. “We had a game plan to nullify their strengths and expose their weaknesses and the boys carried it out to a tee,” he said. State 5 rivals Aspendale Stingrays lost 2-1 away to Old Mentonians on Saturday. The visitors led at half-time thanks to a Peter Dimopoulos goal but Old Mentonians scored twice in the second half through Bannesh Krishnan (61st minute) and Chris Gibson (65th) to take all three points. Aspendale’s best were Brandon De Baize, Kieran Hughes and Jack Lindsay. SATURDAY, 3pm: Langwarrin v Box Hill Utd (Lawton Park), Calder Utd v Southern Utd (Keilor Park Recreation Reserve), Doveton v Mornington (Waratah Reserve), Peninsula Strikers v Berwick City (Centenary Park), Frankston Pines v Bayside Argonauts (Monterey Reserve), Baxter v Dandenong South (Baxter Park), Seaford Utd v Rowville Eagles (North Seaford Reserve), Rosebud v Tullamarine (Olympic Park), Somerville Eagles v Knox Utd (Tyabb Central Recreation Reserve), Pakenham Utd v Aspendale Stingrays (IYU Recreation Reserve).